Kre-O is back! Well, sort of. There appear to be four new sets for the Trolls movie. Which was released back in the first week of November 2016. So why are they just hitting the shelves now? Box. MSRP is $7.99. I paid $9.99 for this at Toys'R'Us. This gives us a $0.18 Price per Piece -- $0.14 at MSRP. a giant head and cloth hair. and that Felt piece could be interesting. Ball Joints, and Clip Plates, not a bad selection and I like the colors. with the extra legs and that ram. Score: +5 (B+). Not bad for a licensed set. I introduced another friend to Mobile Frame Zero: Rapid Attack the other night. These are the results of the second game. The game immediately prior to this can be seen here. High Stepper Soldier Yellow -- 2Rd/1B/1G/1Y/2W. High Stepper Soldier Pink -- 2Rd/1B/1G/1Y/2W. High Stepper Brawler Blue -- 2Rh+d8/1B/1Y/1Gd8/2W. Scrambler Soldier Red -- 2Rd/1B/1G/1Y/2W. Scrambler Soldier White -- 2Rd/1B/1G/1Y/2W. Strider Heavy Assault Green -- 2Rd+d8/1B/1G/2W. This is what the table looked like at the start of the game. My forces are on the left side of the board. Events of Turn 1 (DDC@9): All of our Frames move out and head for the Windmill Station. My Pink Soldier hits Poisonous Pens' Green Heavy Assault for 2 damage. My Yellow Soldier hits it again for 4 damage, destroying it. Events of Turn 2 (DDC@7): My Yellow Soldier seizes the Station. My Pink Soldier hits Poisonous Pens' Red Soldier for 2 damage. My Blue Brawler moves to intercept his White Soldier. Events of Turn 3 (DDC@4): Poisonous Pens' White Soldier hits my Yellow Soldier for 1 damage. My Blue Brawler hits Poisonous Pens' White Soldier for 2 damage. Events of Turn 4 (DDC@1): Poisonous Pens' White Soldier hits my Pink Soldier for 1 damage. After that I tick the Doomsday Clock down to 0. And it looks like I forgot to take pictures of this round. The positions of the Frames didn't change too much though. Poisonous Pens wanted an immediate rematch after the first demo game. Once again we didn't use Single Shot Rockets. We did add an extra Frame per side and increase the time on the Doomsday Clock. The dice did not roll well for him. I introduced another friend to Mobile Frame Zero: Rapid Attack the other night. These are the results of that game. Events of Turn 1 (DDC@7): We both jump out from behind our walls and move towards the Windmill Station in the middle of the board. All attacks either miss or do no damage. Events of Turn 2 (DDC@4): Poisonous Pens' Red Scrambler hits my Pink High Stepper for 1 damage. This allows me top leap forward and seize the Station. I also return fire for 2 damage. My Yellow High Stepper moves into an intercept position. Events of Turn 3 (DDC@2): I pass to force Poisonous Pens to make a mistake and give myself a chance to close out the round. He makes a move with his White Scrambler but falls up short. My Pink High Stepper hits his Red Scrambler for 1 more damage to close out the round. This was Poisonous Pens first exposure to MFZ. We also didn't use Frames with Artillery or Melee attachments. We had a rematch immediately after this. A new week and a new tribe of Mixels. Parts. Those sweeper bits might prove interesting. Plenty of Ball Joints, Clip Plates, Brackets, Bar Plates, Slopes, and Tooth Plates. A couple of Headlight Bricks and Jumper plates too. Several Technic pieces and regular Plates as well. Score: +20 (A+). A new tribe but the same old score. It's Friday and I'm feeling lazy so let's do a picture post. and the drones could be used as a Frame Squad representation. Communications Lab HVA by c0d3monk33. This is purpose built for Intercept Orbit. size of an IO Cruiser but, who wouldn't want this on their game table? and color use that could be re-purposed into smaller designs. the overall length for a Frigate. I love the use of Purple. Let's look at some of the new sets for 2017, shall we? 70904 Clayface Splat Attack -- 448 Pieces for $34.99. Look at all those "Medium Dark Flesh" pieces. And a Batman set coming in at $0.08 per Piece?!? 70911 The Penguin Arctic Roller -- 305 Pieces for $29.99. Plenty of useful pieces across multiple colors. Also an affordable licensed set. 70901 Mr. Freeze Ice Attack -- 201 Pieces for $19.99. Tons of useful parts, good colors, good price. 70349 Ruina's Lock & Roller -- 208 Pieces for $19.99. 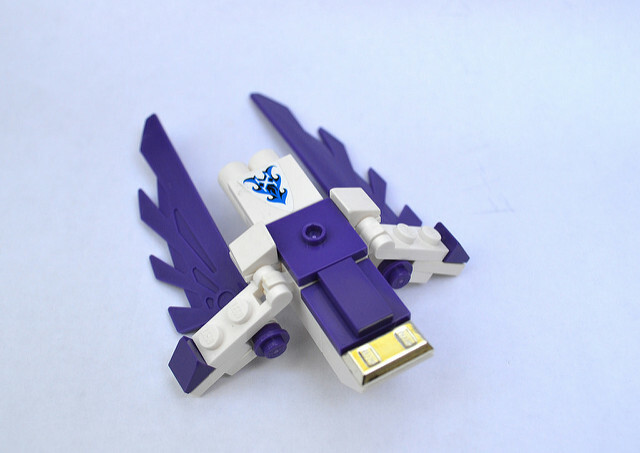 Useful parts and the bad guys for this year's release of Nexo Knights sets use Purple as their accent color. 31062 Robo Explorer -- 205 Pieces for $19.99. Plenty of useful parts -- it is a robot after all -- and lots of Medium Azure. 31058 Mighty Dinosaurs -- 174 Pieces for $14.99. Good parts, good colors, good price. 60152 Sweeper & Excavator -- 299 Pieces for $29.99. Good parts, multiple colors, and it's an affordable City set. 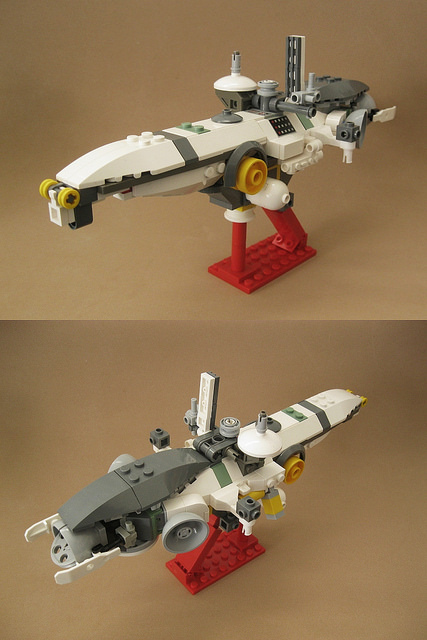 I'll probably do another one of these as soon as Bricklink gets their Parts Lists updated. I built this because I wanted another crack at the Cheapest Biped Challenge. I felt I could do it better and with more interesting colors. It was named by Zeekhotep and Shades Corvid. 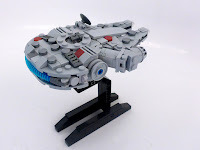 There's a Brickshelf gallery with more pictures. It's essentially just a simplified Lockon with bigger legs and longer arms. Here's the parts list with costs. Once again, I'm thinking about putting together a squad of these to sell at PAX East. They'd have Stations and Attachments and be ready to play, except for dice. Another year and another look at what polybag offerings the Lego Corporation has for us. Once again this information is taken from Brickset. The new Nexo Knights polybags; 30376 Knighton Rider, 30377 Motor Horse, and 30378 Shrunken Headquarters all look interesting. 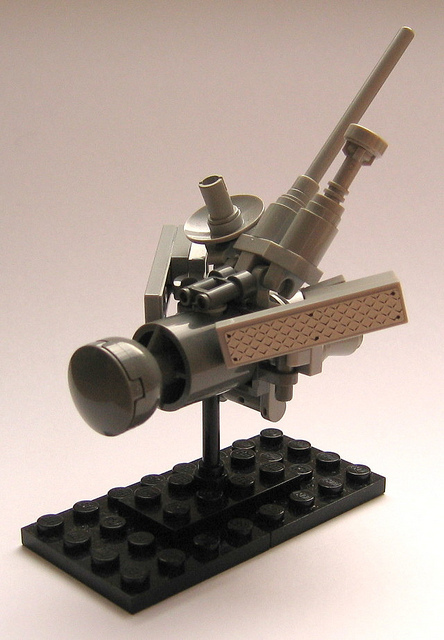 I also like the Ninjago polybag 30426 Stealthy Swamp Airboat. Creator polybags 30476 Happy Turtle and 30477 Chameleon also look fun. Of course 30496 U-Wing Fighter is going to be a must for IO. The Batman Lego Movie Polybags; 30521 The Mini Batmobile, 30522 Batman in the Phantom Zone, 30524 The Mini Batwing, and 5004930 Accessory Pack all look interesting but they all seem to be tied to some sort of promotion or not available yet. 30546 Krypto Saves the Day is already available in Toys'R'Us stores. 30449 Milano should be real interesting, but I feel it will be really difficult to get. Back in April of last year, over on the Hangar, Luke_BMM started the Cheapest Biped Challenge. The point of the challenge was to build a cheap, reasonably sized biped Frame with parts available on the Lego Pick-A-Brick system. This is my entry. I had the initial thought of what would it be like if you combined Ball Joints with some building techniques from Zizy. Here's the parts list with costs. Flat Tile 2x2 (x1) (Category: Plates, Element ID: 306801, Design ID: 3068, Price: $0.07, Total: $0.07) Note: Since this piece will be used to differentiate the Frames from one another, I am not including a color. Overall Total: $4.47 It's not a bad price, but those Hinge Plates really killed my total. I've been thinking about putting together squads of these to sell at PAX East. They'd have Stations and Attachments and be ready to play, except for dice. These are another new release to help expand the Nexo Knights line. Bag. I paid $3.99 for this at Toys'R'Us, which gives us a $0.40 Price per Piece. OUCH! Parts. The Trans-color shields are neat. The Clip Plates, Tile, and Boat Bumper are useful. The triangular piece is going to be really useful. There is no build because you really can't manage one from those parts. Score: -15 (C). That is a really bad score, especially for a non-licensed line. Let's start the new year out right. These were recently released and can be found in the Seasonal aisle at Target. Bag. I paid $3.99 for this, which gives us a $0.07 per piece. Minifig. The Utility Belts may be useful at some point. Parts. Look at all that Dark Red. 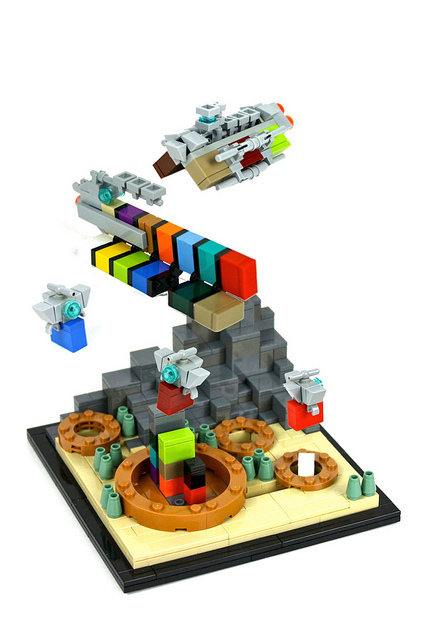 Octagonal Bar Plates, Clip Tiles, Travis Bricks, Bar Claws, and Lightsaber Blades are all great. Everything else is useful too. Build. I copped out and just built the set. I figure it will make for a really fantastic looking IO Frigate. Score: +20 (A+). A really good score for a licensed set.